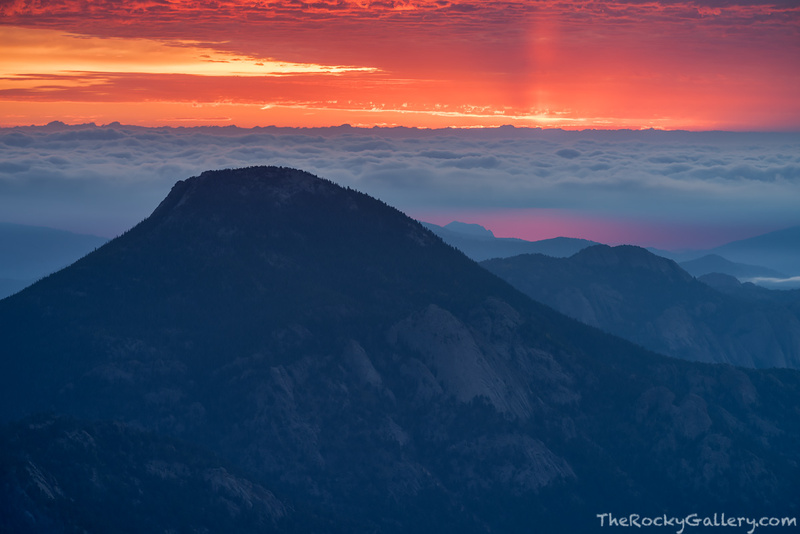 With an inversion hanging over Estes Park and a high deck of clouds above the layer of fog and rain the inversion caused, sunrise was looking less than promising this Sepetember morning along Trail Ridge Road in Rocky Mountain National Park. Somehow the Sun managed to make a brief appearance this morning while putting on a tremendous display of light and color. The skies over McGregor Mountain turned a fiery red and the low clouds from the inversion developed a beautiful purple glow that can be seen just to the right of McGregor Mountain in this view from Rainbow Curve. Photo © copyright by Thomas Mangan.